But with these examples we can see how our font choices communicate for us, outside of the actual words we type with these fonts. Still, these examples are pretty easy targets. And they are two years old! So dig a little deeper and type your new nominee for Worst Font Ever into the comments below. Winner gets a high-five. for me it’s a toss up between Curlz and Gigi, but i think i’ll go with Gigi since it’s harder to read. but who really wants to read words anyway? I had to laugh . . . as part of my ongoing professional development, I regularly read http://www.passiveagressivenotes.com. 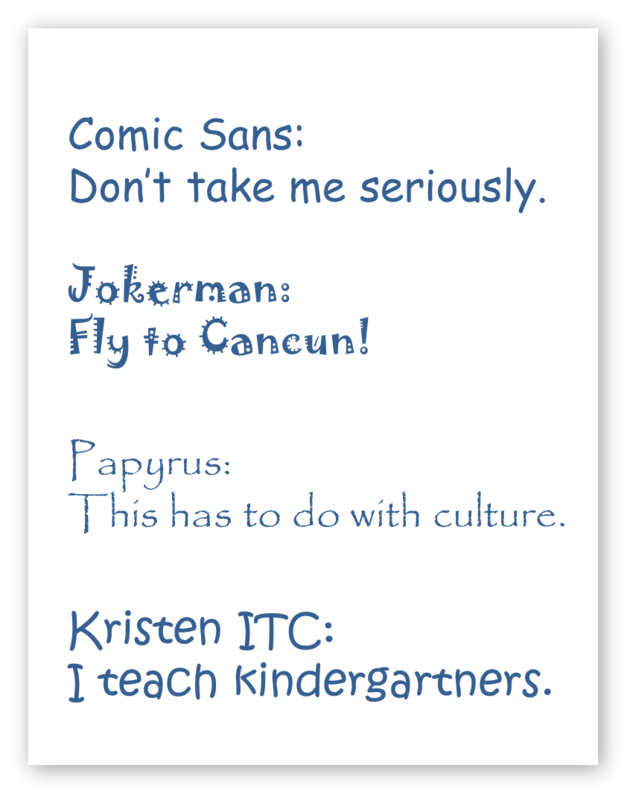 There have been several posts on NOT using Comic Sans in said notes. As a result, I’ve been able to improve my presentations via comments like, “Don’t use Comic Sans. We’re a Fortune 500 company, not a lemonade stand.” Hee, hee.